The Department has made good progress since we last reported on Carrier Strike, however it still has a lot to do to meet its targets at the end of 2020. 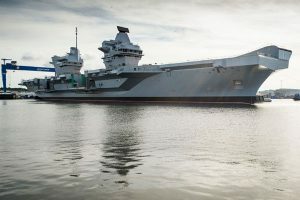 The Ministry of Defence (the Department) has made good progress since the National Audit Office last reported on delivering aircraft carriers, but faces a number of strategic risks which could have a significant impact on delivery, according to its latest report. The construction of the first carrier (HMS Queen Elizabeth) is nearing completion and the Department has clear plans to achieve an initial Carrier Strike operating capability by December 2020. This could, however, be delayed by technical issues which have yet to be resolved. The inaugural sailing of the first carrier is expected in summer 2017, approximately three months later than planned because of technical issues related to the commissioning of the ship’s systems. The Department is assessing their impact on the overall schedule but it believes that the current target of accepting the first carrier from the Aircraft Carrier Alliance (an alliance between the Department and industry) by the end of 2017 is achievable. The next three years will be critical to establishing the Carrier Strike capability. The Department must bring together the carriers, Lightning II jets, and Crowsnest radar with trained crews and supporting infrastructure, logistics, communications and surveillance. It needs to test and operate all these elements together in preparation for deploying Carrier Strike in 2021. The Department has set an ambitious master schedule which brings together the interdependent schedules of the three core programmes to achieve the full capability by 2026. It has taken a number of decisions to address slippage which has compressed the schedule and added risk with limited contingency. There are operational unknowns which will only become clear during testing. For example, the first sailing of HMS Queen Elizabeth will take place in summer 2017, followed by flying trials of Lightning II jets from the carrier at sea in 2018. The NAO found there is increasing pressure on a few highly trained personnel to operate the capability. There is a shortage of military personnel, running at 4% below a target strength of 145,560. Staffing gaps include engineering roles and warfighting specialists in the Royal Navy and engineering, intelligence and some aircrew cadres in the RAF. To minimise the impact of these gaps on Carrier Strike, the Department is prioritising it and carrying out targeted recruitment. The Aircraft Carrier Alliance and the Department are dealing with potential cost growth of between 1% and 2% on the £6.212 billion approved cost of both carriers. The Department has not accepted this increase and is working with the Alliance to minimise any cost growth. The Department has brought forward Lightning II costs originally planned for after 2020, so that two squadrons of jets are available sooner. The total forecast spend of £5.8 billion on Lightning II procurement to 2020 could change if foreign exchange rates shift and the total number of jets on order globally varies. The forecast costs of supporting and operating Carrier Strike are less certain. Support and maintenance costs to March 2021 are forecast at £1.3 billion. Contracts, however, have not been let, and requirements will continue to be refined as the equipment is used. Historically, the Department has underestimated the costs of supporting its equipment. Operational costs up to March 2021 are estimated to be £0.6 billion. Introducing Carrier Strike will fundamentally affect how the Navy works. It will need to move away from deploying single ships to using a significant proportion of its fleet to support and protect the carriers. Before the Department can operate the carriers and jets together as Carrier Strike, there will be an intensive period of training, trials and further work. This period is crucial to ensure crews can safely operate the equipment and give the Department confidence the capability works as intended. The Department has examined the feasibility of deploying Carrier Strike before December 2020 and advised against it in anything other than an operational emergency. The Department has made decisions that could limit how its uses Carrier Strike. The carriers and Lightning II jets rely greatly on technology for military advantage. Technological failures on the carriers might mean that larger crews are needed or place greater pressure on existing personnel. The design and testing of the US-led Lightning II programme is happening concurrently until 2019, increasing the risk that jets already in the UK fleet need modifications. This could reduce the number available for forming the first squadron in readiness for first carrier-based deployment in 2021. The Department accelerated its purchase of Lightning II jets, which will support pilot training, but the number of pilots will be just sufficient up to 2026 with limited resilience in the event that personnel decide to leave the services. Additionally, the Department is relying on an unusually high level of simulator-based training for pilots which, if not sufficiently realistic, could limit how well prepared pilots are to operate the jets. The Department decided to fit Crowsnest radar systems to Navy helicopters that are already in demand, rather than buying new aircraft. High helicopter demand could limit the availability of Crowsnest to protect the carriers.